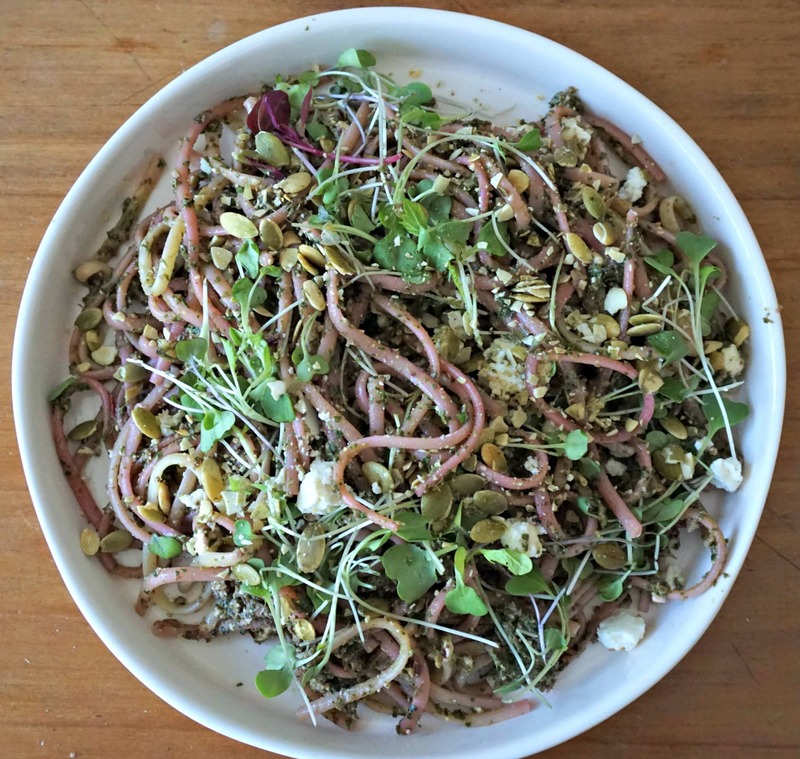 What Inspired this Beet Dandelion Pesto Recipe? 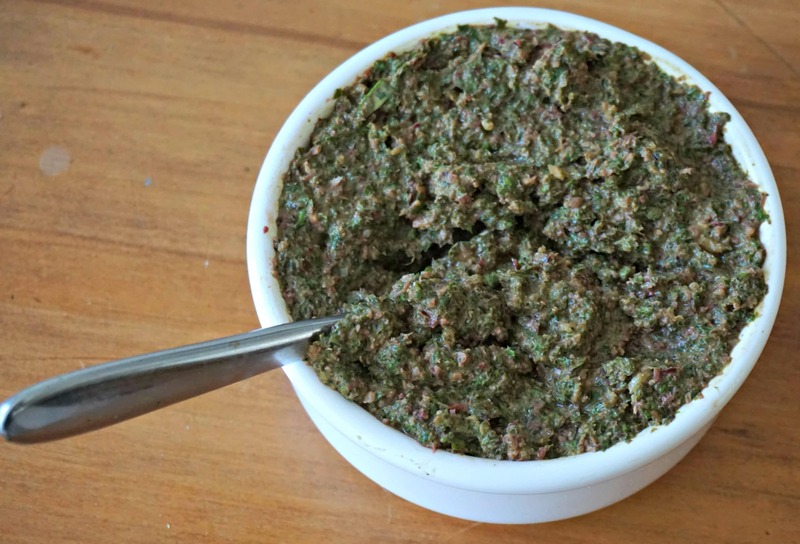 Recently I shared with you my recipe for Dandelion Pesto, prepared primarily with dandelion greens. My trusty Dandelion Pesto recipe inspired me to make this new Beet Dandelion Pesto. Yesterday I purchased some lovely organic beets and needed a way to use the beet greens. I often have high hopes for beet greens. 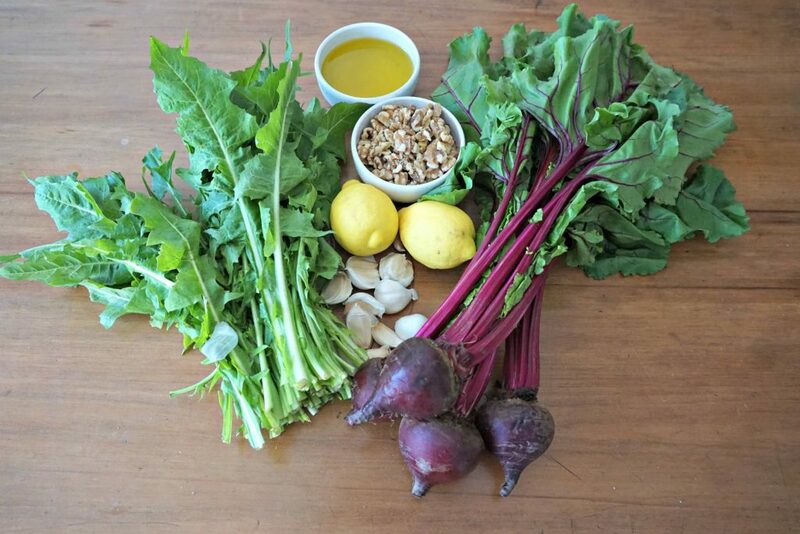 When I purchase beets, which is quite frequently, I try to select beets with lovely greens still attached. Beet greens are very nutritious. It would be such a shame to waste them. I throw some beet greens into a salad or sauté them, alone or with other greens, with a little olive oil and garlic. Heating the beet greens, like the dandelion greens, reduces their nutritional benefits. I love using dandelion greens in the spring as they seem to be everywhere and they are so healthy. Dandelion greens help cleanse your liver if you need to detoxify your body. For vegans dandelion greens can provide healthy boosts of much-needed calcium and iron as well as many other nutrients and antioxidants. What makes this Beet Dandelion Pesto so special? To start is the combined nutritional benefits of both beet greens and dandelion greens in a full-flavor sauce. Both the beet and dandelion greens are bitter with a strong taste. Garlic, olive oil and walnuts help temper the bitterness of these healthy greens. Adding a bit of nutritional yeast or even a carrot (for vegans) or parmesan or feta cheese (for vegetarians) can further reduce the bitterness if you prefer. Do not despair if your Beet Dandelion Pesto tastes bitter to you. When you add it to hot pasta and add a little of the pasta water, the flavor will be less strong and bitter. The bright green color of the Dandelion Pesto is so lovely. I was therefore a bit disappointed to discover the unattractive color of the Beet Dandelion Pesto. I did not, however, let the color deter me and continued on my quest to make a new pesto. The pesto’s color improved drastically when I added a few spoonfuls on top of linguine pasta. The beet greens turned some pasta purple while the dandelion greens turned it green. 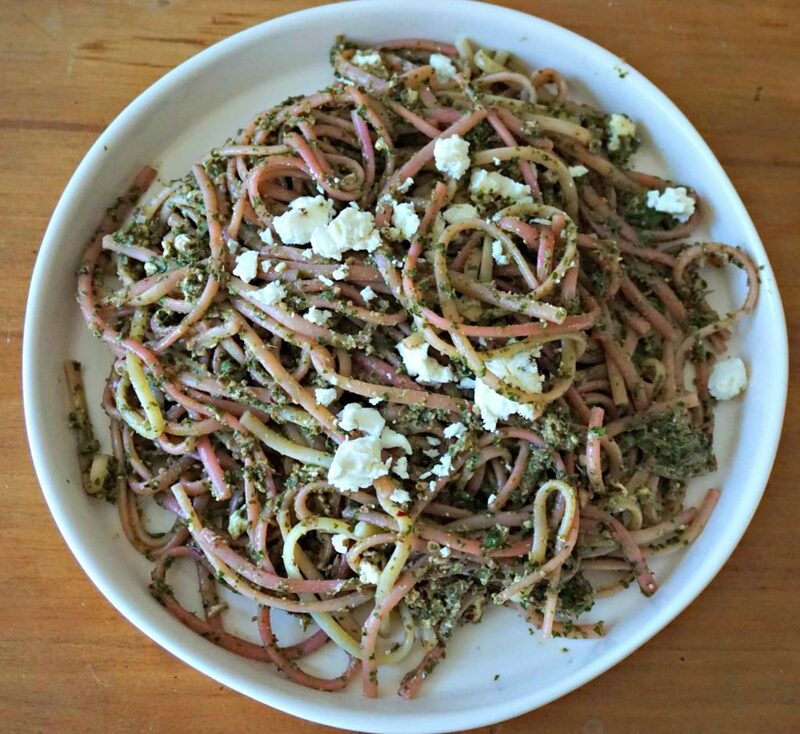 Pasta with the Beet Dandelion Pesto is tasty just as it is. If you prefer adding other ingredients, try some vegetables or leafy greens, nuts or seeds, dairy or vegan cheese, or whatever else that inspires you. I added some crumbled feta cheese, micro-greens and crushed pumpkin seeds. Although the taste of feta cheese paired fine with the Beet Dandelion Pesto, I made a mental note to try adding a milder goat cheese next time. The goat cheese would blend better with the beet greens, I think. The next day I added a little grated Parmesan on top of the pesto and pasta. The more subtle taste of the Parmesan cheese toned down the stronger flavors of the other pesto ingredients while letting them shine together. Try making some Beet Dandelion Pesto with fresh ingredients. In ten minutes you will create something that will liven your dish while nourishing your body. Use the social media links to share this recipe with your friends. Beet Dandelion Pesto is tasty, healthy and easy to prepare. In about ten minutes you can prepare a portion large enough for several dishes. One serving is equal to 1 tablespoon, which is enough for about 2 2/3oz / 80g of pasta. Gather all the ingredients and prepare them for mixing. Sort the leaves of the beet greens and dandelion greens by removing all the wilting or badly bruised leaves. Wash all remaining leaves and dry as well as you can. Add all the ingredients into the food processor. Pulse about 30 seconds or until the ingredients mix into a nice consistency for pesto. Use immediately over pasta. Use some pasta water to dilute the pesto sauce and get the consistency you like. The pasta water will emulsify the sauce when it mixes with the olive oil. If you like add some grated Parmesan cheese. The Beet and Dandelion Greens Pesto will conserve in an airtight container in the refrigerator for up to a week. You can also freeze the pesto by pouring it in ice trays and letting them freeze. Put the pesto ice cubes into a freezer bag and keep until use in soups, pasta, or whatever you like. Hi Melissa, let me know how you like it when you try it. It’s so easy to make and will enhance your pasta or other dish nutritionally as well as with flavor. Thanks! Thank you very much for your beets recipes. I grow my own organic veggies and usually harvest a lot of beets and I am tired of cooking the same recipes all over and over again. Yours are truly inspiring and original flavours. Will follow your blog from now on. Hi Romeo, I appreciate your kind words very much. I also love beets, as you can see. You’d probably like the Roasted Beets and Fennel on Pasta recipe found on this blog. Try it and share with me your feedback.